There is no absolute right answer in choosing a monohull over a catamaran charter. Both have their advantages and disadvantages. Catamarans are a special type of boats– multi-hulls. They are made of two hulls connected by the spacious body, which makes them the most spacious and most stabile type of boats. They are most popular with families and larger groups because of their spacious interior and easy access. There is relatively a lot of space and headroom in the cabins of a catamaran (beds are longer and wider), and the saloon and the galley are on the same level with the cockpit which offers panoramic view and eases the access inside. They are especially practical if there are small children on board - because of their wide body they are quite stabile, they are low and have swimming ladder which allows easy climbing on board from the land and from the water, and they are commodious enough so you don’t feel closed in or claustrophobic. Also, they allow you to approach the coast very close and anchor in shallow waters, small coves and hidden places which is unlike for all conventional sailing yachts with a keel. Most catamarans have 4 to 6 cabins, which means they can comfortably accommodate 8 to 12 people – perfect for your entire family. Another advantage is that they are easier to navigate than standard sailing or motor boats. A catamaran usually sails faster than a monohull on some points of sail, such as a beam reach and downwind. They are a perfect choice for easy-going, comfortable cruise for you and many of your friends and family. Depending on your preferences, we can offer you: bareboat and crewed catamarans. 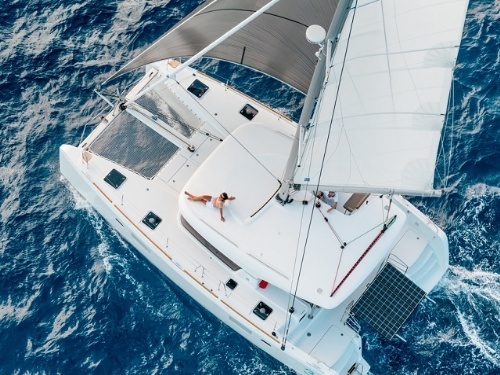 Catamarans in our offer are available for charter in Croatia but also in the surrounding countries like Slovenia, Italy, Montenegro, Greece as well as other Mediterranean countries. Check out the new catamarans available for charter in 2019!